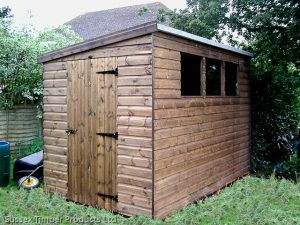 Garden Sheds » Sussex Timber Products Ltd.
Garden sheds are available in apex and pent roof types, with two types of cladding - T&G Shiplap and T&G Loglap. All fixtures and fittings, fixings, roofing felt and glass are included for D.I.Y installation. 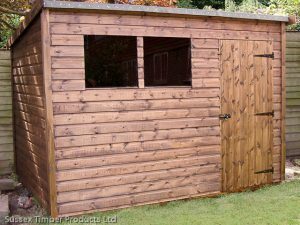 Prices are listed below, if you would like us to install your shed for you. Extra heavy duty bearers are also available if required. Double door (only on 8'x6' and larger). Pent low height: 6'4" (1930mm). Pent high height: 7'0" (2130mm).